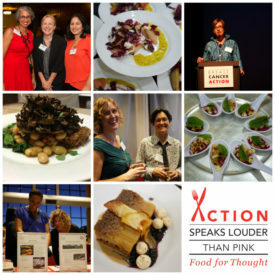 Our 7th Annual Action Speaks Louder Than Pink–Food for Thought event will be October 16, 2017. Early-bird tickets are now available, until September 22. Get yours today! Join us for a powerful program and a delicious four-course dinner prepared by some of the San Francisco Bay Area’s best (and most generous) chefs, including Eric Tucker from Millennium, Charlie Ayers from Calafia, Bronson Macomber from Macadamia Events, and Sascha Weiss from Project Juice (formerly at The Plant Cafe Organic). This promises to be an evening you won’t forget. Don’t miss this opportunity to savor a fabulous meal while supporting Breast Cancer Action. Monday, October 16, 2017, 6:00–9:00 p.m.
Vegetarian and vegan options for all courses are available upon request. The venue is wheelchair accessible. Our thought-provoking program will highlight our award-winning Think Before You Pink® campaign, which calls for transparency and accountability in breast cancer fundraising, and encourages people to ask critical questions about pink ribbon promotions. If you can’t join us in person, please consider joining us in spirit by making a donation or becoming an event sponsor. And if you don’t live in the San Francisco Bay Area, please forward this invitation to your friends and family who do! All proceeds from this event benefit our work to address and end the breast cancer epidemic. Questions? Please contact Chantelle Thomas. This entry was posted in BCA Action Alerts, BCA Events, BCA News, E-Alerts.